There’s nothing better than hitting the open road and exploring somewhere new… even more so if you can do it from the comfort and ease of an RV. So when the opportunity to explore the Mackay region in our very own Maui Motorhome came up, we jumped on it. On our epic 5 day road trip we experienced some of the amazing natural beauty, wildlife, sights and tastes this region has to offer. First stop on our Mackay adventure was Cape Hillsborough National Park. 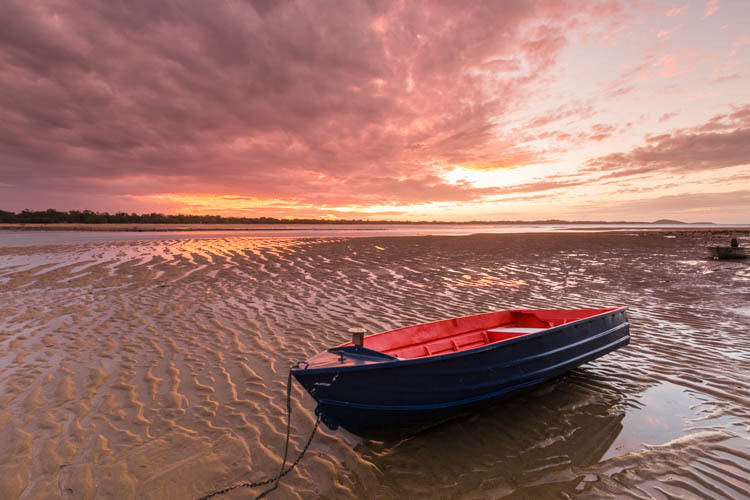 This ruggedly beautiful coastal park features broad beaches, rocky headlands, pine and eucalypt forests. 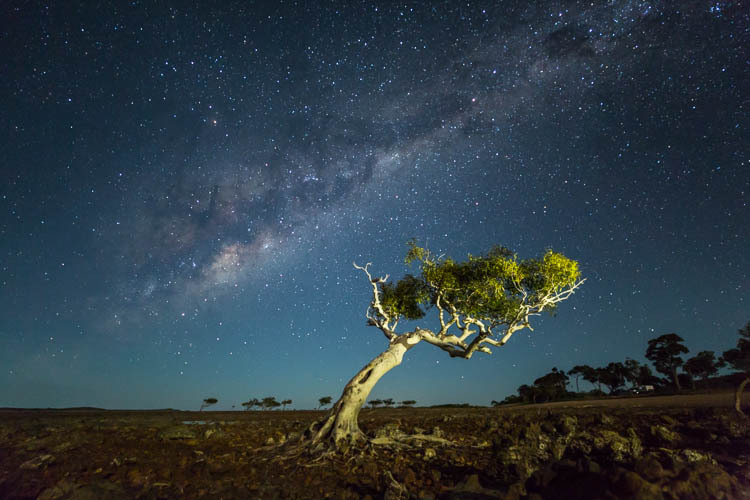 Despite being less than an hour’s drive north of Mackay, it feels remote and secluded. It’s also the location to experience one of Queensland’s most unique wildlife encounters. Our campervan stay for the night was at the Cape Hillsborough Nature Tourist Park. 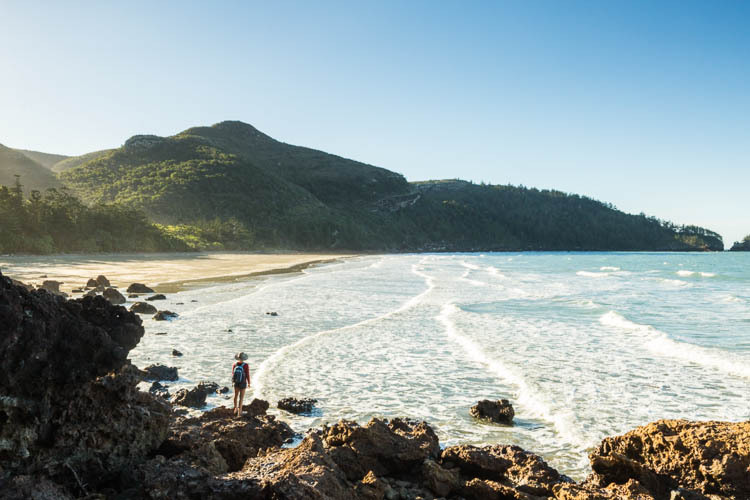 Nestled right on the beach, it’s perfectly located for the many hiking trails weaving through the National Park and offers a range of beach accommodation and campsites. Waking up early next morning, we excitedly wandered down to the beach. In the darkness, two tall forms approached, revealing themselves as kangaroos. Soon after, a dozen or so wallabies arrived, happily feeding on mangrove seed pods in the dawn glow. 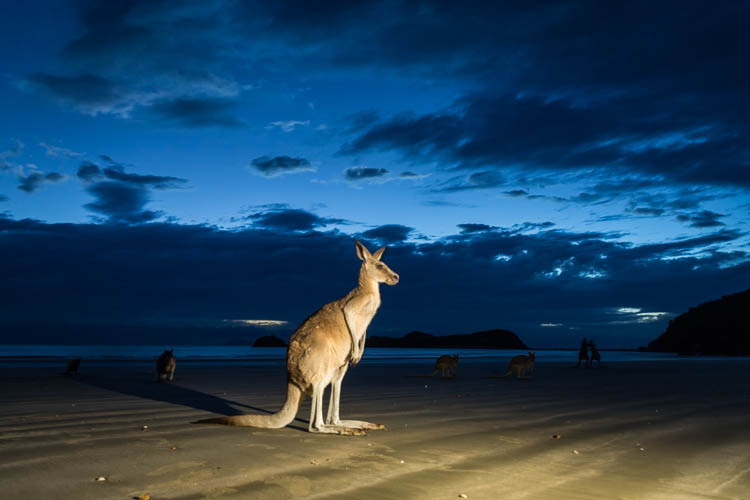 It’s this unique, sunrise spectacle that has seen Cape Hillsborough’s popularity soar in recent years – so much so that Mackay Tourism has recently begun their “Sunrise with Wallabies Tour”. These tours are aimed at ensuring both the sustainability of this iconic wildlife encounter, and the well-being of the animals and visitors. This magical experience is definitely worth protecting. After their brief morning feed, the wallabies returned to their bush habitat, leaving us to explore the volcanic rock formations dotted along the beach. Still buzzing from our wildlife experience, we fueled up with a hearty breakfast at the Nature Tourist Park before packing up camp. Leaving the beach behind, we stopped at The Old Station Teahouse. Set in a 110 year old former railway station, it’s the perfect spot for a Devonshire tea or light lunch. We opted for some wonderful homemade scones and jam amidst the lush garden surrounds. Driving inland, we were soon greeted by the green surrounds of the Pioneer Valley. Here, the road cuts through huge swathes of sugar cane, hemmed in by forest hills either side. 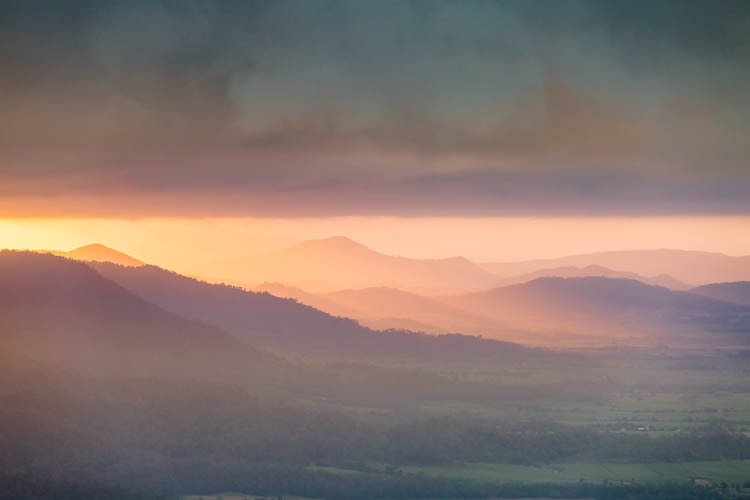 We passed sugar mills and small country towns before the road climbed steeply up to our highland destination – Eungella National Park (pronounced young-glah), aptly meaning ‘land of clouds’ in the local indigenous language. 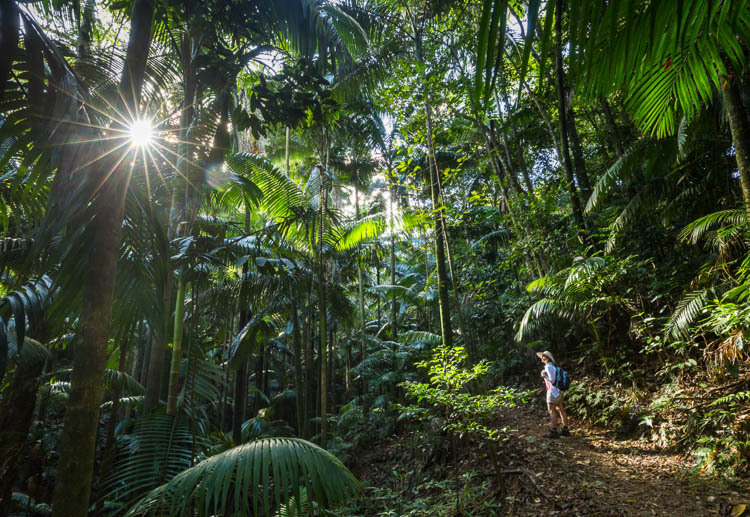 Eungella National Park covers nearly 500 sq kilometres and is Australia’s longest stretch of sub-tropical rainforest. Much of this is remote and inaccessible, except for walking tracks around Broken River and Finch Hatton Gorge. This isolation makes it a habitat for numerous endemic species, as well as one of the best locations in Australia to spot a platypus. We set up camp on the banks of the Broken River, before enjoying lunch at the nearby Platypus Lodge Restaurant & Café. The waffles here are a ‘must-do’, as well as the ‘Swiss Yodel burger’, which comes complete with an impressive “Yodel-Ay-Hee-Hoo” rendition by the restaurant’s Swiss chef, Oskar. The afternoon was spent exploring some of the National Park walking trails. The Rainforest Discovery circuit (800m – 30 mins return) crossed trickling creeks and provided easy rainforest immersion. Closer to the township of Eungella, the Palm Grove to Cedar Grove track (2.8km 1.5hr return) was a highlight, with the opportunity to stand inside the remarkable strangler fig tree arch. Being up in the cool highlands air, we loved the welcoming fireplace at the Possums Table Restaurant that evening and their generous dinner offerings. The restaurant is part of the Broken River Mountain Resort, handily situated directly opposite the Eungella National Park campsite. From the Sky Window circuit (250m – 10 mins), we looked out over the Pioneer Valley at sunrise next morning. Fog and cloud hung over the Clarke Range but the dawn rays lit them up nicely and the views were nothing short of stunning. Dawn in Eungella National Park also happens to be the best time to see a platypus. Back at the Broken River, we waited quietly for the tell-tale sign of bubbles on the surface. While we waited, freshwater turtles swam by and azure kingfishers darted along the riverbank. Soon enough a platypus appeared – small, brown and unmistakable with it’s duck-bill and beaver-like tail. It would float at the surface for an instant before diving and rummaging through the creek floor, disappearing in a plume of silt before popping up again, somewhere nearby. That morning we were lucky to see several platypuses along the river. Each time we’d sit transfixed by their curious behaviour, feeling very privileged to have witnessed them in the wild. 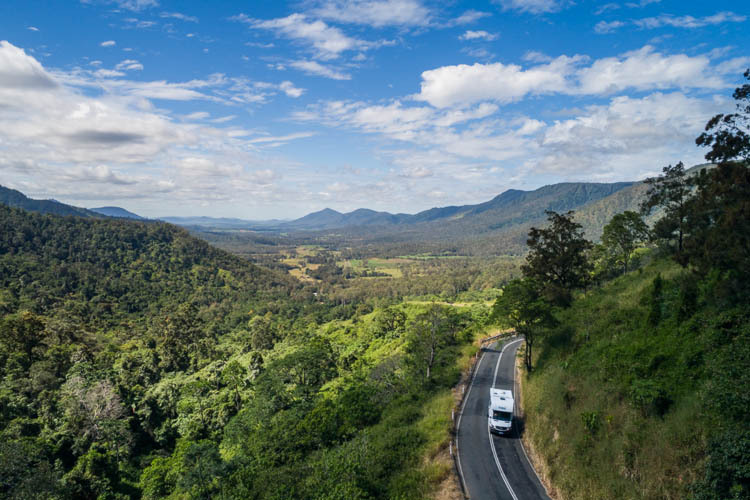 A breakfast stop at the Eungella Chalet gave us one last chance to take in some wonderful Pioneer Valley views, before the drive down to Finch Hatton Gorge. A short 2km section of unsealed road and some shallow creek crossings just before the gorge, make the journey feel like a real adventure. 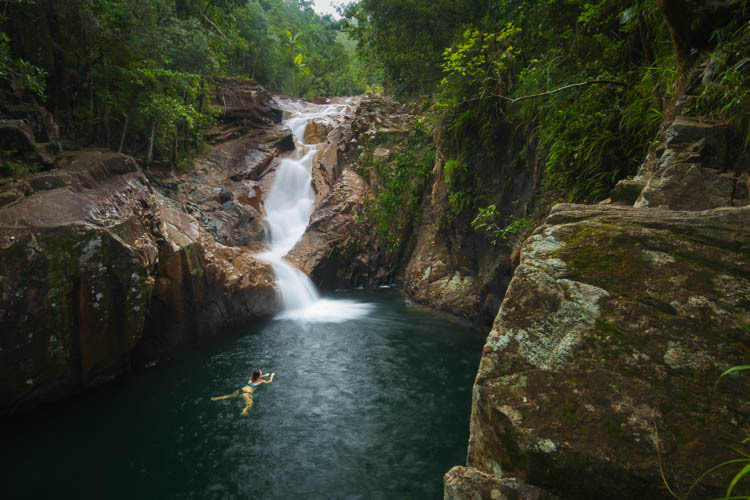 It’s definitely worth it, as you’re rewarded with a glorious landscape of freshwater streams and sub-tropical rainforest. We decided on the shorter of the two possible walking trails – to Araluen Cascades (a round trip of around 2.8km). At Araluen, a stunning waterfall spills into a carved rock pool, ideal for a cool dip. The bushwalk itself is beautiful, with a shaded backdrop of palm forests and volcanic boulders. On our drive to Mackay from Finch Hatton, we dropped in at the Pinnacle Family Hotel – famous for it fresh baked pies. Their pies truly are a showstopper – big and tasty. Definitely stop by and try one of their awesome meat pies topped with mushy peas. Arriving in Mackay late afternoon, we checked out the Kommo Toera Trail (located in Slade Point Nature Reserve) – a meandering 1km trail through towering Melaleuca wetlands. Sunset Bay beach, in the northern suburb of Eimeo, sounded like the perfect spot to finish the day. It didn’t disappoint, with a golden glow bathing the tidal sand flats, framed by coconut palms. We pulled into the Big 4 Mackay Marine Tourist Park for the night, located a stone’s throw from the CBD and Mackay waterfront. After, we dined out with harbour views at the Breakwater Restaurant and Bar, tucking into one of their delicious seafood platters. Sunrise in Mackay is definitely all about the beaches. At Lamberts Lookout next morning, we parked the campervan and enjoyed views out over Lamberts Beach and the Coral Sea. The lookout is also known as a prime spot to see passing whales during their migration along the coast. It was time to head south – firstly to the township of Sarina for a guided tour of the Sarina Sugar Shed. Here we learnt all about how sugar cane is grown, harvested and processed and got to try sugar in its many forms – from cane stalk through to molasses and the finished product. After taste-testing some of their award-winning sauces and sweet treats, we departed on a sugar high with a sampler pack of goodies. Another 80km south of Sarina, we arrived at Clairview Beach and checked in at our seaside campsite at Barracrab Caravan Park. The name kind of gives away what this place is all about. Fishing is the game here – whether you like it off the beach or if you have your own boat. It’s also a spot to simply chill out and take in the vista of coconut palms against a luminous blue-green sea. Low tide here exposes a landscape of stony shoals and gnarled mangrove trees to be explored. Sunrise was just as stunning at Clairview – the sky lighting up in wispy, pastel shades over the sea. It seemed very fitting for our last day in the Mackay region. With the campervan squared away, we headed north again, pulling in at Shoal Point beach in Mackay. At this pretty spot, the sand stretches out like a coastal desert at low tide, with shimmering views out to nearby Green Island. We couldn’t resist one last chance to visit Cape Hillsborough on our way home. Just as we’d hoped, we saw our wallaby friends again – grazing happily just beyond the beach – on our hike to stunning Beachcomber Cove. And with the sun setting behind the peaks of the Cape Hillsborough, we only wished our motorhome adventure was longer. 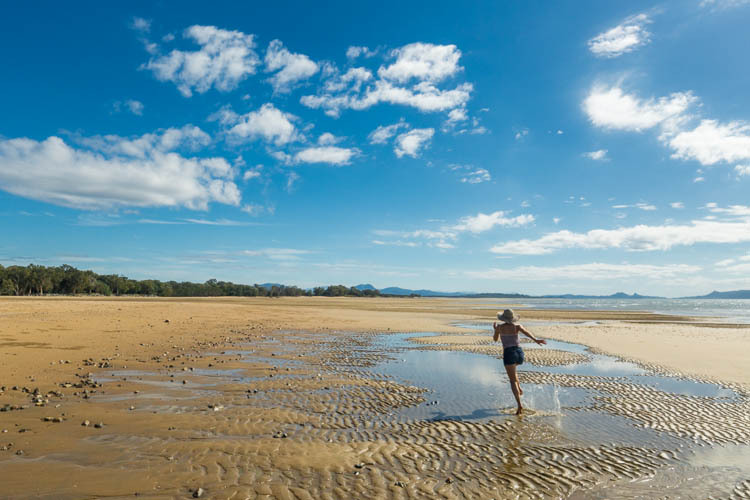 The Mackay region has surprised and enthralled us and there’s no doubt we’ll be back again soon. All the images Copyright Andrew Watson 2018. 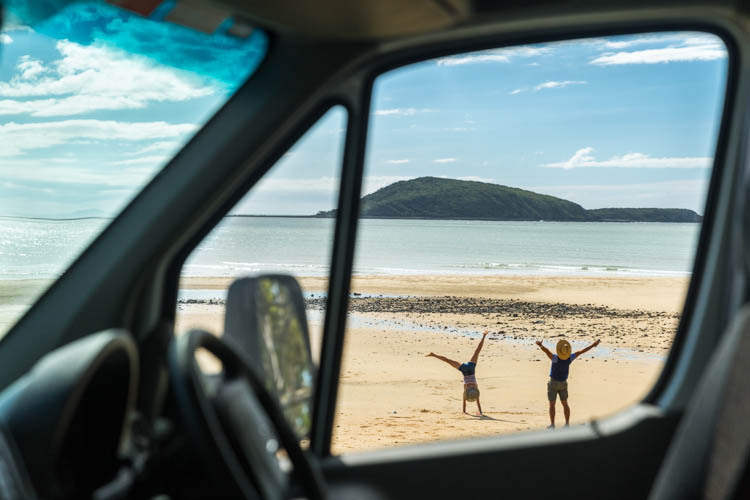 This road trip was taken in partnership with Mackay Tourism. All opinions expressed in this blog are my own, honest and unbiased. 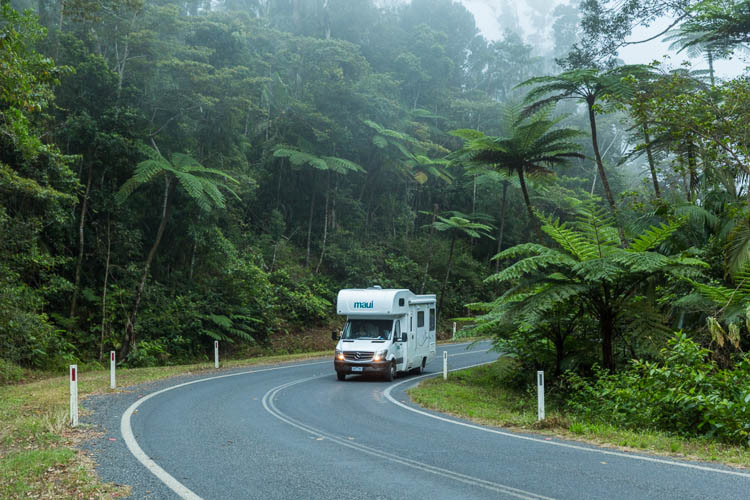 This entry was posted in Tourism & Lifestyle, Travel and tagged Adventure, Australia, Campervan, Cape Hillsborough National Park, Clairview, Digital Influencer, Eungella National Park, Landscapes, Lifestyle, Mackay, Motorhome, Nature, Photography, Queensland, Road Trip, Sarina, Tourism, Travel, Travel photography, Wildlife. Bookmark the permalink.